When one looks at the two island clusters known as the British Isles and Japanese archipelago, one is struck by their similarities. In terms of basic environmental characteristics, however, the dissimilarities and their ramifications seem more noteworthy. Most obviously, the British Isles and Japan are island clusters. Moreover, they are quite similar in size, with Japan encompassing some 145,000 square miles and the British Isles (Ireland and United Kingdom) some 120,000. The two clusters are both situated in the north temperate zone and at roughly comparable distances from the same continent, Eurasia. As a corollary to this similarity of location, they share temperate-zone climates and biosystems. Similarities extend to the human population and its historical experience. Both populations moved, at roughly comparable times, through the basic technological phases from forager to agricultural and thence to industrial society. The two traced similar trajectories of demographic growth and social elaboration. And today they are both highly industrialized, densely settled societies, with Japan counting over 800 people per square mile and UK/Ireland about 500. Both societies are known for their long-lasting monarchies, which enjoy social prominence even today. Also for their early-industrial empires, of which the British survived somewhat longer and has had a more enduring global impact. Both societies have their own languages, but in both cases those languages have been powerfully enriched by long-running social interaction with nearby continental societies. If one were to strip English of its words of French derivation and Japanese of its words of Chinese derivation, one would end up with two severely handicapped languages. And finally, one could argue that both societies share similar social values, with considerable emphasis given to personal self-discipline, self-restraint, dutifulness, modesty in demeanor, and propriety in one's social relationships. These many dimensions of similarity notwithstanding, regarding matters environmental, the dissimilarities between these two island clusters seem more instructive. The topic can be approached in terms of paleogeology, global location, and topography. (1) Paleogeology. The British Isles are ancient, their basic terrain having been formed some 400 to 300 million years ago as part of a large continental mass. During the most recent 65 million years or so, tectonic processes have caused that terrain gradually to separate from its mother continent, but most of the original terrain has survived to the present. 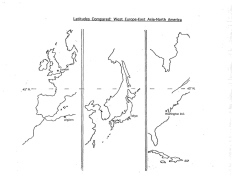 Parts of Japan also derive from a separated patch of continent. Due to faulting and erosion, however, most of the original terrain disappeared into the ocean some 20-15 million years ago. Subsequently the area was rebuilt and thrust upward by volcanic and other tectonic processes, mostly during the past 5 million years or so. Which means that whereas the British Isles constitute one of the planet's old land surfaces, the Japanese archipelago is one of its very youngest. (2) Global Location. 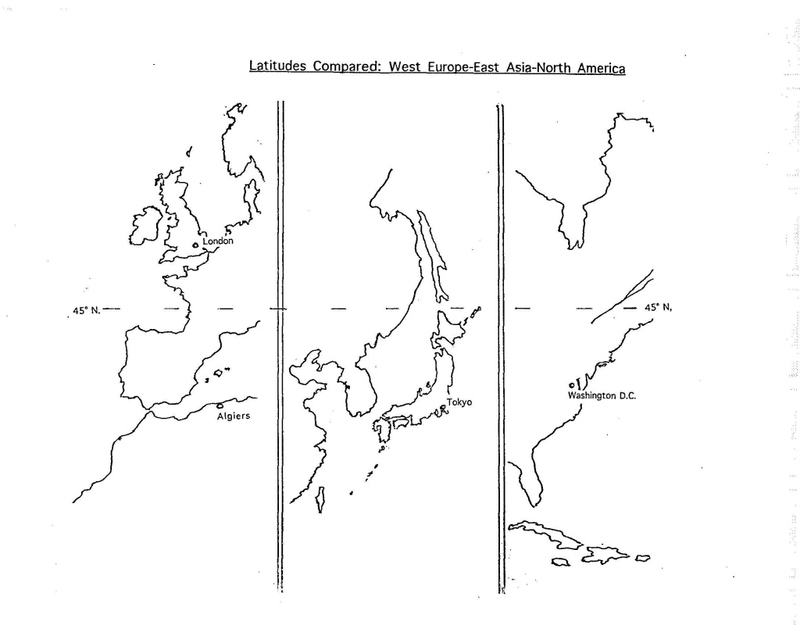 The fact that the British Isles lie on the eastern edge of an ocean while the Japanese archipelago lies on the eastern edge of a continent has meant that their climates have been very dissimilar, even though both cycle through the temperate-zone seasons from winter to spring, summer, and autumn, This dissimilarity reflects the powerful influence of the northern hemisphere's prevailing westerly winds. In the British case, even though the southernmost point of England lies some 300 miles north of the northernmost point of Japan, the Isles have significantly warmer winters, thanks to the Atlantic Ocean and its Gulf Stream, which carries warm equatorial water up the eastern seaboard of North America and thence eastward toward Ireland. This warmer water raises the temperature of westerly surface winds enough so that the Isles experience ample cold, winter rain but very little snow. By contrast, the mountainous parts of central and northern Japan, which are exposed to cold masses of air blowing southeastward out of Siberia, regularly get buried under snow that in some places can accumulate to several feet and last through the winter. And even the easterly and southerly parts of Japan experience freezing temperatures and occasional snow during winter months. During summer, however, ocean-cooled winds off the Atlantic give the British Isles relatively comfortable summers. By contrast, monsoon winds that blow up across most of Japan from Southeast Asia bring warmth and rain during June, followed by a summer of hot, muggy weather and autumn typhoons before cold air from Siberia re-establishes its dominance. Global location has also caused long-term changes in global temperature to have had very dissimilar impacts on the two island clusters. When the planet has moved into cold glacial periods --most notably during the past 2 million years, the Pleistocene epoch -- northwestern Europe, including the British Isles, has been buried under immense depths of ice that persisted for thousands of years, in the process stripping the region of its biosystem. The Japanese archipelago, on the other hand, like most of Northeast Asia, was spared all but a few field glaciers in high mountain areas. In consequence, most of the archipelago remained clothed in conifer forests throughout even the coldest phases of the Pleistocene epoch. (3) Topography. These first two factors -- the vast difference in geological age of the two island clusters and their striking climatic differences due to global location -- have produced two very dissimilar topographies, which in turn have played a basic role in shaping the British and Japanese biosystems and human experiences. The British Isles consist mainly of flat or gently rolling lowlands that phase northwestwardly into more hilly country, especially in Scotland. These uplands are mostly well rounded and not very high, thanks to their long exposure to erosion and the grinding effect of glacial ice. The highest mountain in the Isles, Ben Nevis in Scotland, stands only about 4,400 feet above sea level. Japan, on the other hand, is only about 20% lowland, with some 80% being hillside and highland. Whereas much lowland in the British Isles is gently rolling terrain resting atop ancient bedrock, moreover, the lowland of Japan is primarily alluvial floodplain of recent, post-glacial provenance -- roughly 6,000 years old or younger. Most of that floodplain is very flat and consists of deep soil. Regarding the mountainous areas, because of the archipelago's extreme geological youth and its lack of glacial experience, its mountain ranges rise abruptly from the lowland and mostly consist of steep hillsides, high, sharp ridges, and narrow, dendritic valley systems. Many of those mountain ranges stand 6,000 to 10,000 feet above sea level, and Japan's highest peak, the volcanic Mt. Fuji, rises some 12,390 feet, nearly three times as high as Ben Nevis. What, then, have been the environmental ramifications of these climatic and topographical characteristics? Let us look at their influence on biological life, forests, agriculture, and human settlement patterns. (1) Biological Life. The glaciers that recurrently buried the British Isles and much of northwestern Europe ravaged the biosystem there. And because so many of the species that had been driven out of the region could return to the Isles after the glacial retreat only by migrating north across the Mediterranean, over the Alps or Pyrenees, and then across the English Channel and Irish Sea, the process of return was slow, difficult, and ultimately yielded a biosystem of comparatively little diversity. By contrast, when glacial-age cooling occurred in northeast Asia, sea level dropped enough so that the Japanese archipelago's threatened species were able to retreat southward across a broad coastal plain that linked Japan to east China and thence southeast Asia. When warming recommenced, species were able to migrate northward over the same coastal plain. And after it was re-flooded, diverse species could advance northward on the Japan Current -- whether as seeds, seedlings, or passengers on floating tree trunks, etc.-- traveling from the Philippines-Taiwan region up through the Ryukyu Island chain to the shores of Japan. Because east and southeast Asia are regions of rich biodiversity, these patterns of plant and animal movement have enabled the archipelago to share fully in that richness. Thus, whereas northwest Europe, including the British Isles, has retained some 80 native species of commercially useful trees, East Asia, including Japan, has retained some 500. That biodiversity also reflects another geographical dissimilarity. Both the Isles and archipelago are vertically extended, but Japan reaches farther from north to south. Because the British Isles' climate is controlled by the Atlantic Ocean, the north-south temperature range is relatively modest, and native biosystem differences are correspondingly limited. In Japan, on the other hand, the north is subject to cool/cold continental weather year-round, whereas the southern littoral is much more subject to warm oceanic influence. In consequence, the archipelago's indigenous biosystem ranges from coniferous boreal species in the north to sub-tropical evergreen species on the southern edge. (2) Forests. Because of the British Isles' relatively gentle topography, as human demand for fuel wood and construction timber grew over the centuries, more and more woodland was deforested. Much of the area was then converted to cropland and pasturage. Especially in westerly regions, moreover, cold rainy winters fostered the growth of peat moss on deforested areas. In consequence, even where land was not converted to agricultural use, new tree seedlings fared poorly and ever more woodland evolved into moorland covered with peat moss, heather, and other scrub growth. In the outcome, today less than 10% of the British isles is forested. In Japan, on the other hand, most mountain areas are too precipitous for agricultural use. So, whereas lowlands were cleared and converted to cropland, logged hillsides were generally left to reforest. And because peat moss fares poorly in Japan's snowy winters, those hillsides have mostly been able to reforest successfully. Farmers' demand for mulch did gradually damage some hilly areas, especially in south-central Japan. Moreover, the steepness of most mountainsides has meant that during deluges denuded woodland could produce ruinous flooding and avalanches. To avoid locally devastating events of that sort, communities customarily have left steep hillsides unscavenged, so that they could retain their forest cover. In consequence, some 70% of the archipelago is wooded even today, about half of that in old-growth stands and half in even-aged plantation forest. (3) Agriculture. The British Isles -- with their expanses of fertile lowland, their comparatively gentle hillsides, and their year-round rainfall -- have proven very receptive to animal pasturage and dry-field cropping of such grains as wheat and barley. Because animal husbandry yields even less food per acre than do dryfield grains, these differences in agricultural regimen have meant that Japanese farmers extracted a much higher caloric yield-per-acre from their farmland than could farmers of the British Isles, enabling a much larger human population to live on far less arable land. In short, Japanese agriculture, and hence Japanese society, has remained much more fully tied to a viable natural biosystem than has the agriculture and society of the British Isles. (4) Human Settlement Patterns. Finally, the topography of these island clusters has shaped the patterns of human settlement. Because the British Isles have such extensive and generally rolling lowlands, humans have been able to settle widely about the realm -- whether as households, villages, towns, or cities. Japan, on the other hand, is so deeply incised by steep mountains that only lowlands and foot hills have been amenable to settlement. In consequence, while population density for the archipelago as a whole is not radically greater than that of the British Isles, in actual practice the populace is much more densely packed into the available lowlands. And that density is further intensified by the high value of paddy fields and the strong social desire to preserve that farmland insofar as possible. In consequence, although Japan today is one of the world's most affluent and technically developed societies, it still has an urban population density akin to that of a so-called "underdeveloped country." The contrast with Britain is noteworthy; the contrast with American urban sprawl is breathtaking. But as global population swells and global food supplies become more tenuous, is not the Japanese settlement pattern more indicative of the future? Finally, let us consider a couple of other thoughts about the British Isles, rather than the Japanese archipelago. The fact that most woodland in the Isles was lost to agriculture and peat moss did not end the human population's need for heating fuel or construction timber. The need for fuel led to the digging and burning of peat and the discovery of "ground coal," which proved substantially more satisfactory than peat because it burned so much cleaner and hotter. But was it perhaps the requirements of coal -- the need to extract it from deeper and deeper underground, to transport it farther, and to burn it at a much higher temperature -- that both spurred and enabled the emergence in England of new "industrial" technologies such as the steam engine? And was it the loss of woodland, and hence the loss of construction timber, that spurred occupants of the British Isles to seek timber from abroad -- in the Baltic Sea littoral initially, then North America, and eventually India -- and in the process to find advantage in empire-building? 1 Erosion of dry fields and pasturage and the long-term effects thereof are not "the other guy's" problem. Their seriousness in the USA today is adumbrated by the essay "A 50-Year Farm Bill" in the New York Times (Jan. 5, 2009), p. A21.